Allergies are a common affliction in cats and fall into four categories. Insect, inhaled, contact and food. An allergy is an inappropriate immune response to a harmless substance (allergen) and is different from intolerances such as to milk in that the immune system isn’t involved. Allergies can be seasonal or occur year round. Symptoms can vary depending on the type of allergy/allergen, but many allergy symptoms in cats relate to the skin. Fleas bite allergy is the most common allergy in cats. 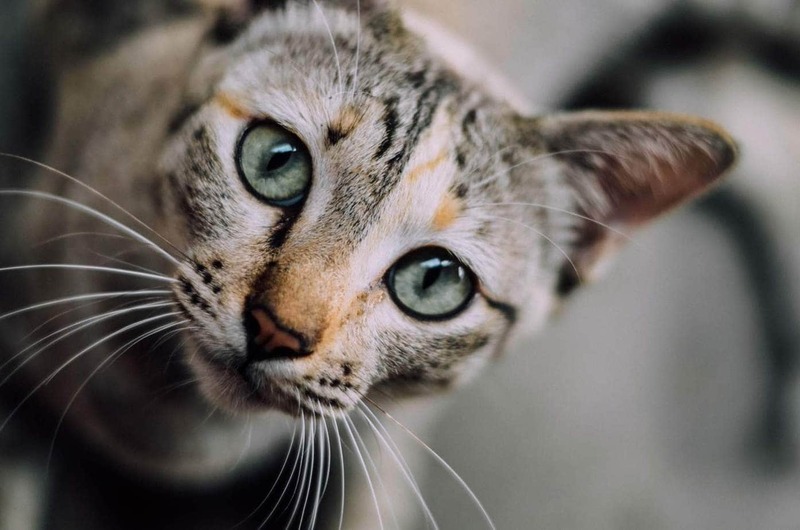 The flea feeds on the blood of the cat, injecting its saliva into the skin as it does this which can trigger an allergy in a large number of cats. Itching, miliary dermatitis (small, hard scabs, especially at the base of the tail) and scabs around the neck are the most common symptoms. Just one flea can be enough to trigger an allergic response. Remove fleas from the cat and treat the home as only 10% of the flea life cycle is spent on the cat so diligent environmental decontamination is also essential. Treat secondary skin infections caused by excessive biting and scratching of the skin. This may involve a course of antibiotics, medicated shampoo and or a topical medication. Antihistamines or oral tablets or steroid injections to control inflammation and reduce itching. 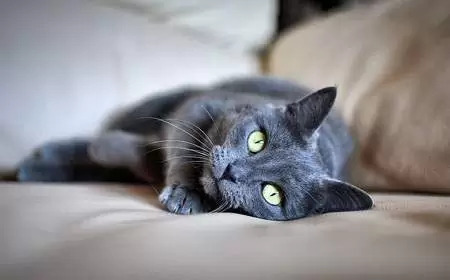 Long-term steroid use can produce side effects, therefore the dosage should be as small as possible and treatment limited until your cat has healed and the flea problem has been controlled. Anti-inflammatory injection to reduce the itching. Maintain a regular flea schedule to prevent fleas from returning. Dust mites are microscopic arachnids (the same class of animal as spiders) which live inside homes feeding on the skin flakes of humans and animals. The feces of dust mites is a common allergen in both people and pets. Anti-allergy shampoo to wash away allergens and treat the skin. Immunotherapy which exposes the cat to the allergen via injection or oral drops in increasing amounts in order to re-train the immune system to ignore allergen. Cyclosporine or corticosteroids are both immunosuppressants which can be used in cats unresponsive to immunotherapy. It is almost impossible to completely eliminate dust mites from the home, but it is possible to reduce numbers by taking a few simple steps. Wash human and animal bedding once a week in hot water and hang outside in the sun for a minimum of three hours. Replace air conditioning filters with HEPA filters which filter out smaller particles than normal filters. Where possible, replace carpet with wooden flooring or tiles. Vacuum and mop floors frequently. Storage mites (also called grain mites, mould mites and cheese mites) are a close relative to the dust mite. They feed finely ground grains, wheat germ, yeast, cheese, powdered milk, flour, dry dog and cat food as well as mould spores which grow on food. In some cats, storage mite allergy may be incorrectly attributed to a food allergy. Antibiotics if a secondary bacterial skin infection has developed. Allergen immunotherapy involves the regular administration of gradually increasing doses of the causative allergen. It can be given to the cat as an injection or drops under the tongue (sublingual). The purpose of immunotherapy is to change the way the cat’s immune system responds to allergens so that it no longer responds. Consider switching to canned cat food or a home made cooked or raw diet. Store dry food in an airtight container in a cool and dry area. Buy small bags of food (cat and human) and store in the freezer, this won’t kill the mites but will prevent them reproducing. If freezer space is an issue, decant dry food from the bag and store in an airtight container, avoid pouring the dusty debris from the bottom of the bag into the container. Wash the storage container in hot soapy water and thoroughly dry before you add new food. Dispose of pet food bags immediately, in the outside garbage bin. Always use food before it has reached its use by date. Reduce humidity in the house, storage mites thrive in humidity of 65-85%. Wash pet food bowls in hot soapy water once a day. Vacuum and mop where pets eat to remove any debris. Moulds are microscopic fungi which live in the environment. They thrive in dark and moist conditions in poorly ventilated areas. There are many varieties of mould, which reproduce by releasing spores (the mould equivalent of seeds) into the air which can cause allergies and breathing problems in humans and pets when they are inhaled. Manage symptoms associated with mould allergy with antihistamines and/or corticosteroids. While this can offer relief, it is important to eliminate mould from the home due to the health risks associated with mould exposure. Food allergies are the second most common allergy in cats and can develop at any age, but typically develop in cats over 12 months. Common food allergens include beef, lamb, chicken, seafood, soy, eggs, and wheat. If the veterinarian suspects a food allergy, the cat will go on a food trial, which involves feeding a novel source of protein (such as kangaroo or duck) for several weeks to see if symptoms resolve. At this time, the cat must not eat any other type of food or treat. If symptoms resolve, the cat will then go back onto its normal diet to see if symptoms return. Corticosteroids or antihistamines to control itching until symptoms resolve. Antibiotics if a skin infection has developed due to trauma. Avoid the food which has caused the allergy by switching the cat to a novel protein, homemade or hypoallergenic diet. If you have decided to feed your cat a homemade diet, introduce one new ingredient at a time and see how your cat reacts to it. For example, you have your cat on a diet of kangaroo meat and the allergies go away, introduce beef and see how he reacts. If there are no signs of allergies over a few weeks you know you can feed him this, introduce lamb, watch for signs of allergies returning etc. This way, you can slowly increase the type of food your cat can eat. Not technically a household allergy, but common nonetheless. Pollen allergies are the same as hayfever in cats and are caused by the inhalation or ingestion (when the cat grooms) of pollen in the air. Unlike most of the other allergies in cats, pollen allergies are often seasonal and start in spring. In warmer climates, pollen allergies can occur year round. Minimising contact with the allergen is the main goal as well as controlling symptoms. Obviously, it is not always easy to avoid exposure to pollens. Keep windows shut, use HEPA air filters, regularly dust can reduce exposure. Steroids to control inflammation and suppress the immune system. Your veterinarian will prescribe the lowest dose possible to manage symptoms and it will be necessary to closely monitor your cat. Keep the cat indoors as much as possible during high pollen season. Pollen counts are at their highest from dawn to mid-morning. Medicated shampoos and conditioners can be used to clean the coat of pollens, reducing the amount that is inhaled and ingested during grooming. This can also help to soothe inflamed and itchy skin. Allergen immunotherapy (allergy shots or drops). The use of plastic food and water bowls has been linked to feline acne, which is a condition affecting the chin of cats. Blackheads develop in the hair follicles which over time become inflamed and infected. Mild acne can be treated at home. Clean the area with diluted chlorhexidine (HiBiScrub), iodine (Betadine) or witch hazel after the cat has eaten. Obviously switch from plastic to ceramic, glass or stainless steel food and water bowls and wash daily in hot, soapy water. Rinse thoroughly. Topical antiseborrheic medications. Clean the skin with an ointment or gel containing benzoyl peroxide 2.5 to 5% (such as OxyDex), a broad-spectrum antibacterial product that also has anti-itching properties. Some cats may experience irritation with this product. Salicylic acid is another topical medication which can be used topically, brands include Stri-dex and Clearasil. Watch for signs of redness or inflammation when treating your cat with topical products. Consult your veterinarian if your cat does show signs of irritation as he will be able to recommend a more suitable product, or a varied skin treatment schedule. Topical antibiotic ointment. Administer 2% mupirocin, clindamycin or tetracycline containing products when furuncles (boils) and draining tracts are present. Topical glucocorticoids to reduce inflammation or oral glucocorticoids such as prednisone for severe inflammation and swelling. Any medication can potentially cause an allergic reaction in cats. Antibiotics are a common cause, steroids, anesthetic, sulfa drugs, creams, and topical flea products. Drug allergies can become more severe with repeated exposure. Symptoms can range from skin rashes to life-threatening anaphylaxis, a severe, rapid onset and life-threatening reaction to an allergen. Discontinue medications which have caused the allergy and replace with more suitable medication. Anaphylaxis is a medical emergency and must be treated immediately. Administration of epinephrine (adrenaline) will be necessary. This is an intramuscular injection which counteracts the adverse effects such as relaxing the airways, making breathing easier, increases blood pressure by causing constriction (tightening) of the blood vessels (which dilate during anaphylaxis) as well as preventing the further release of cytotoxic granules. Supportive care such as oxygen therapy and IV fluids may also be given to assist with breathing. Cigarettes contain 43 known carcinogens (cancer-causing substances) and can induce a number of other medical problems including allergies. Cats are at increased risk because they are exposed to the smoke via the airways as well as their coat when they groom. Don’t smoke around cats, smoke outside and wash your hands before you handle your cat.